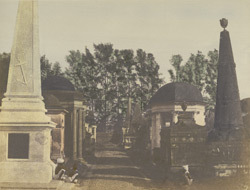 A Hand-coloured print of tombs in South Park Street Cemetery, Calcutta from the Fiebig Collection: Views of Calcutta and Surrounding Districts, taken by Frederick Fiebig in 1851. Park Street was originally known as Burying Ground Road, but was renamed after the nearby park. South Park Street Cemetery was opened in 1767 but by 1785 was full, which lead to the opening of North park Street Cemetery. Later in 1840 both Cemeteries spread across the Mahratta Ditch, which, by then, had been renamed Lower Circular Road. Many famous figures are buried here such as William Jones, the founder of the Asiatic Society, Robert Kydd, the founder of the botanical gardens and Henry Derozio, founder of the Young Bengal Movement. The cemetery includes a variety of funerary sculpture like pyramids, catafalques, pavilions and obelisks of varying sizes.